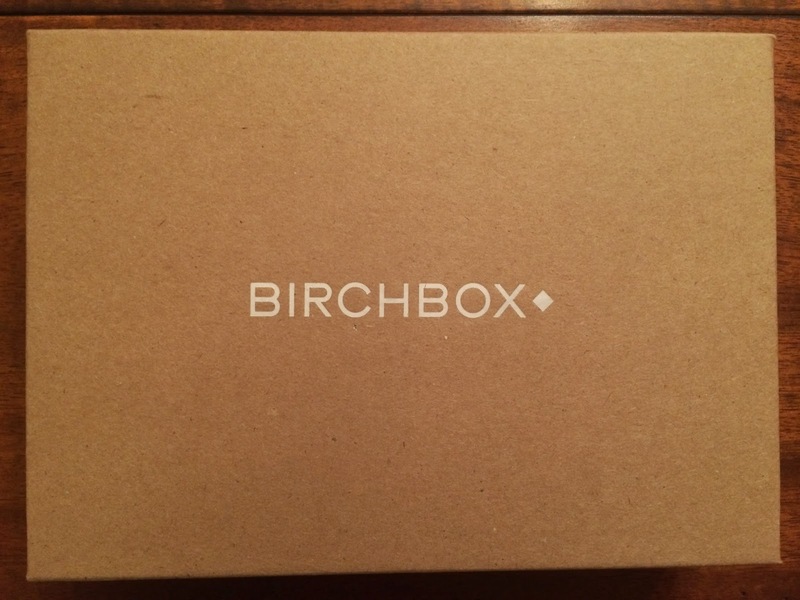 I love everything in my Birchbox this month! The theme for this month's box was "Lighten Up". "Here's to keeping cool and laughing our way into fall." 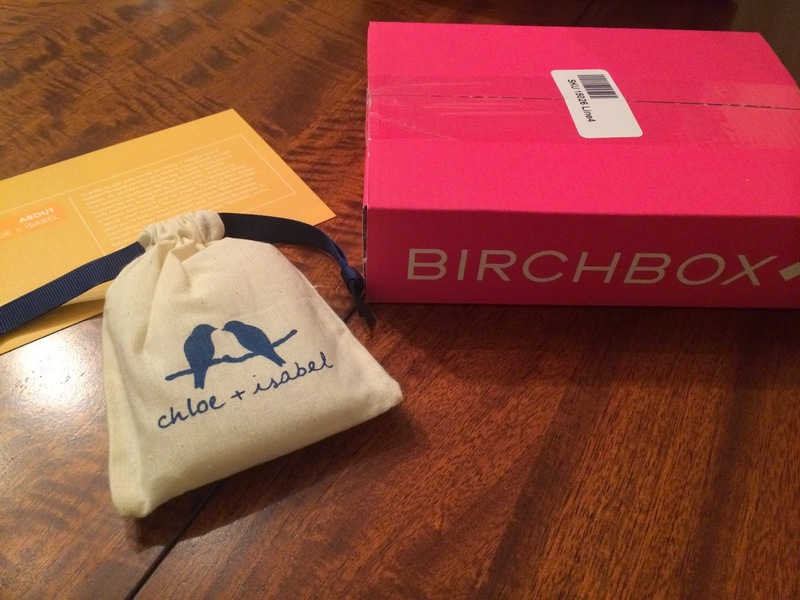 And just about every month Birchbox gives subscribers the option to add on items. I usually never do, but this month I couldn't resist one of the items. I tried, but then I kept looking at it and looking at it and I knew I needed it. So, I'll review that too! And since I ordered an add on my box shipped in a large box!!! I'll talk about my add on item first. 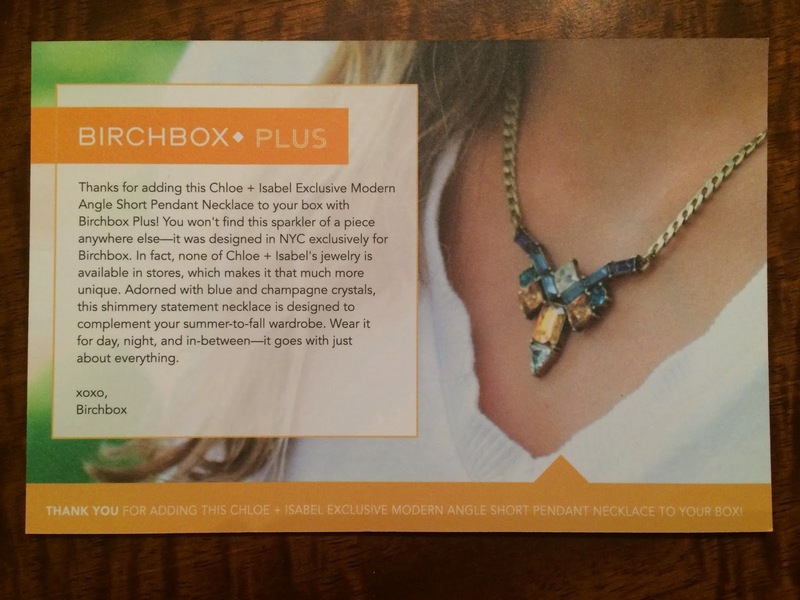 It is the Chloe + Isabel Exclusive Modern Angle Short Pendant Necklace. It was designed in NYC exclusively for Birchbox! When I saw pictures of the necklace with blue and champagne crystals, I knew I had to have it. 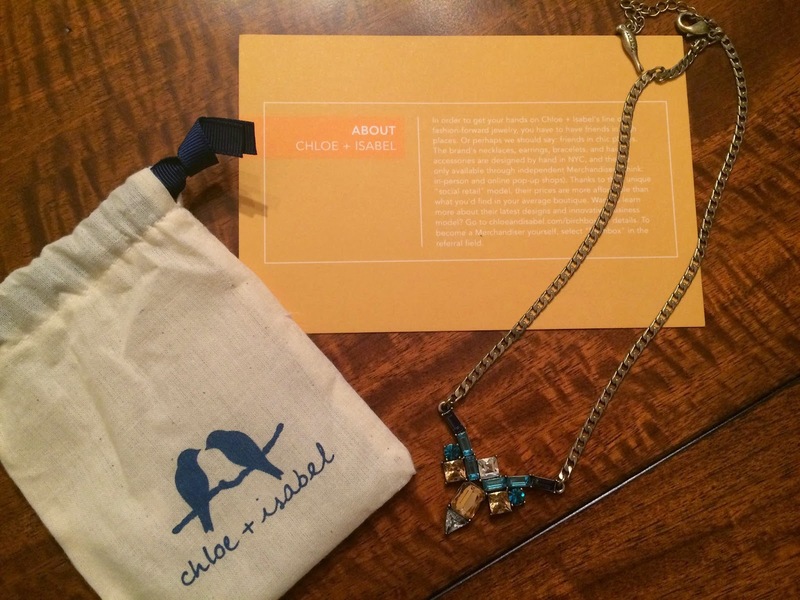 I'd never heard of Chloe + Isabel, so I wasn't sure what to expect. How cute is the little drawstring bag it came in?!? I knew when I saw it, I made the right choice to add it on! It came with a cute card including details about the necklace. 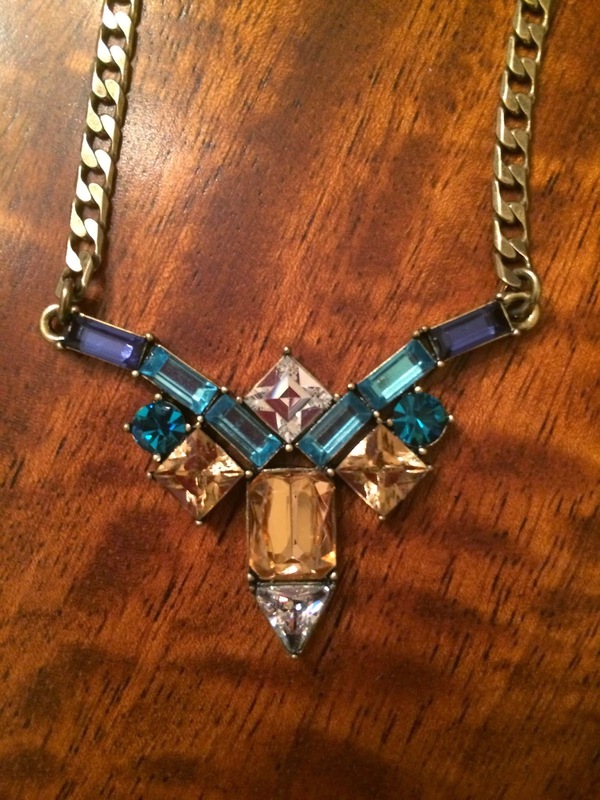 I went a bit crazy taking pictures (because I'm in love with this necklace)!!! And I couldn't resist the bird bag. Here is a close up of the crystals and chain. It's very nice quality and I love the colors!!! My favorite part! 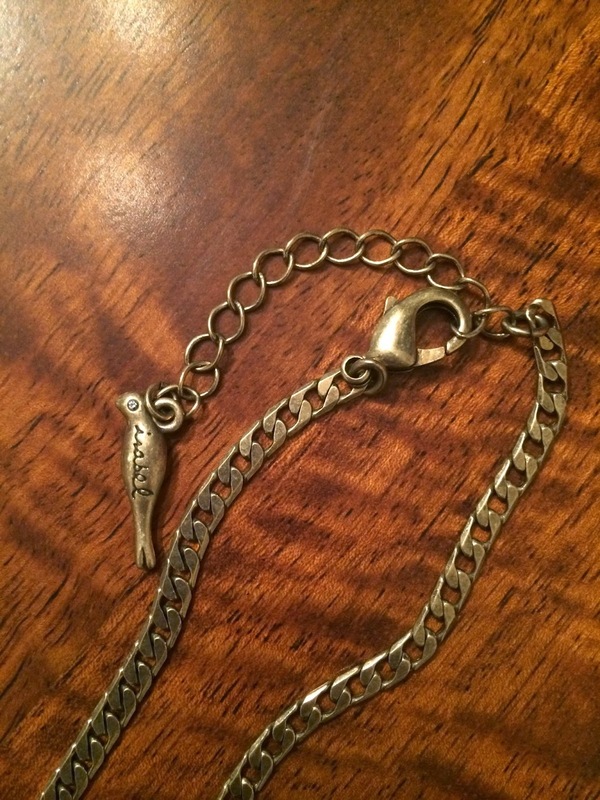 How cute is the little bird on the chain?!? It even has a crystal for the eyes. Sorry I'm raving on and on, I really like this one!!! And here I'm wearing it with my horseshoe necklace (which I haven't taken off, since I received it in a Popsugar Must Have box). 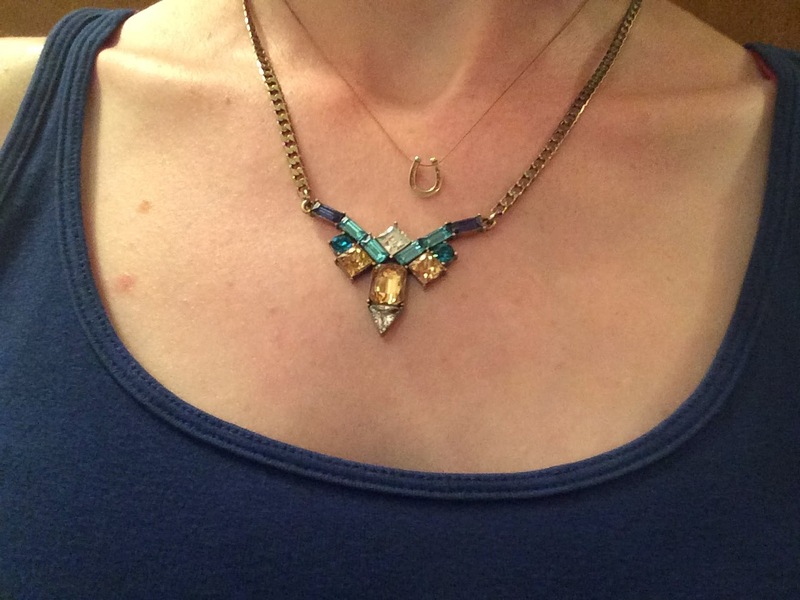 This necklace is the perfect size for me and has just the right amount of sparkle, plus I'm a total fan of blue! I promise this was the last picture of the necklace. Isn't it lovely though?!? Now onto my regular Birchbox for August. 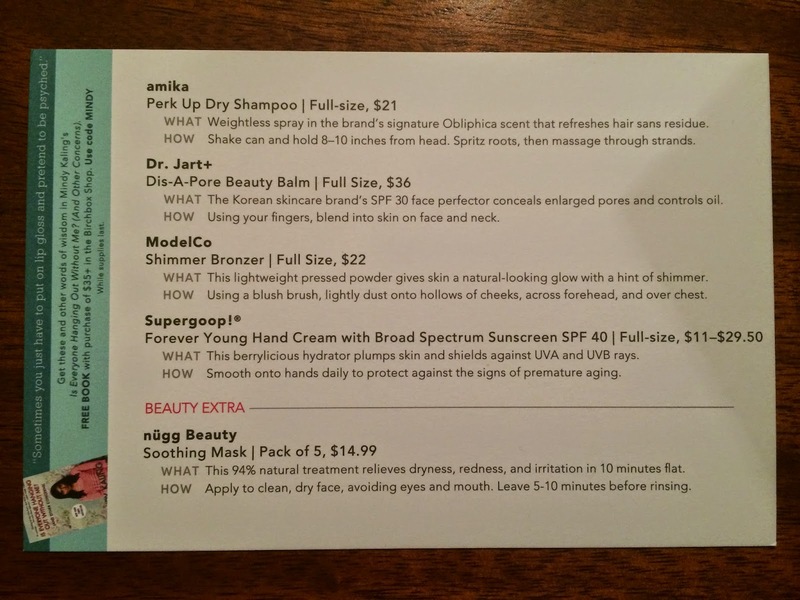 Birchbox always includes an information card detailing all the items included in the box. And the other side of the card describes the theme for the month "Lighten Up". Here's a look at what I received. 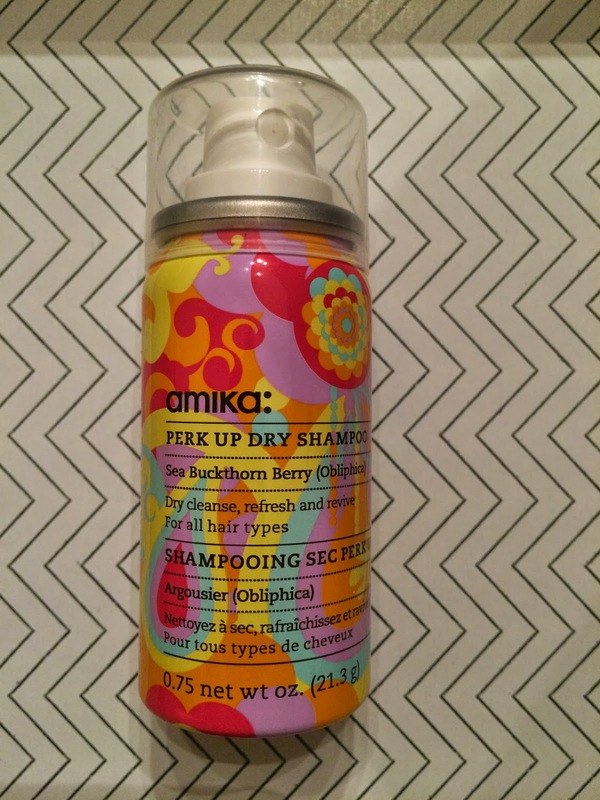 The first sample I received and the product that stood out most in the box was Amika Perk Up Dry Shampoo. I love the packaging on this and was excited to try it. It smelled like hairspray when I first sprayed it, but then it left the prettiest scent in my hair. I think this might be my favorite dry shampoo because of the scent and packaging! And it worked well, leaving no residue. 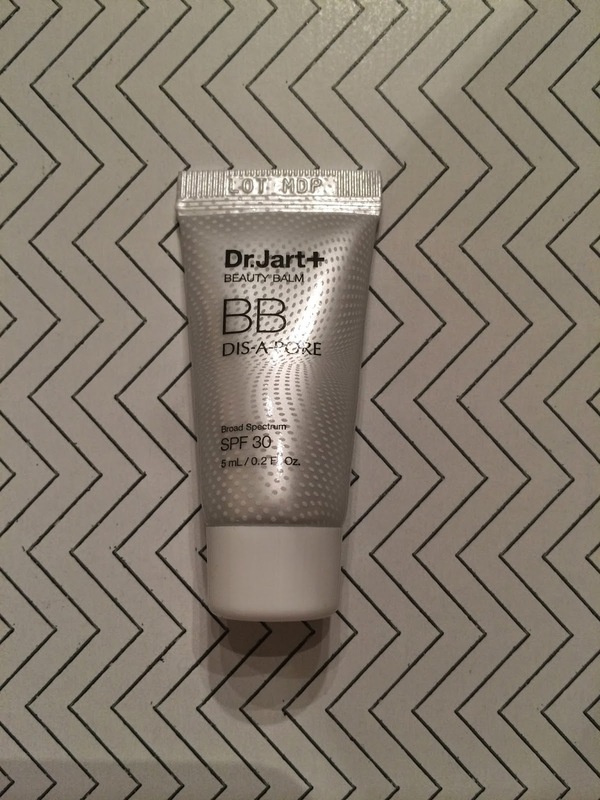 The next sample I received was Dr Jart+ Dis-A-Pore Beauty Balm. I don't ever expect these products to work, but this one really made my pores smaller and my skin prettier. It blended in nicely to my fair skin and didn't feel heavy. It also kept my skin from looking greasy all day (even in the heat). I will continue to use this and might have to buy the full size. I also received ModelCo Shimmer Bronzer. 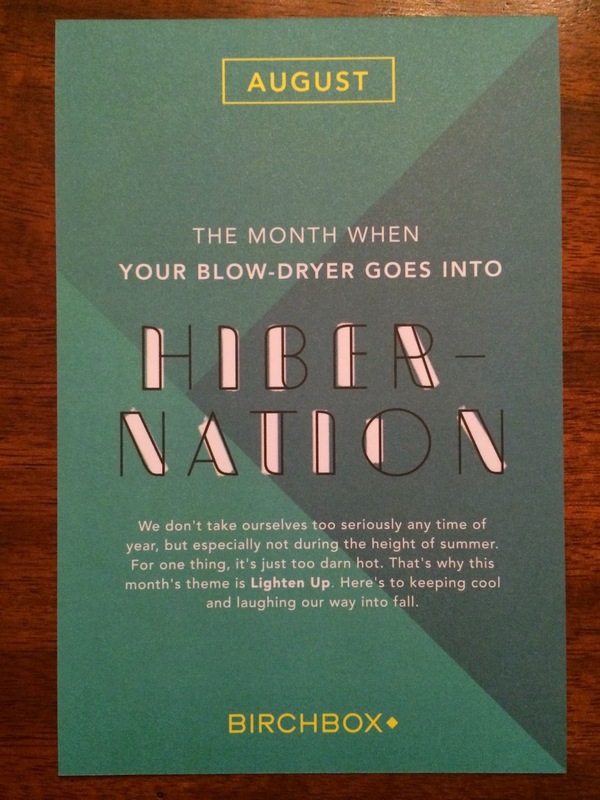 This month Birchbox let subscribers choose one of their samples and this was my choice. 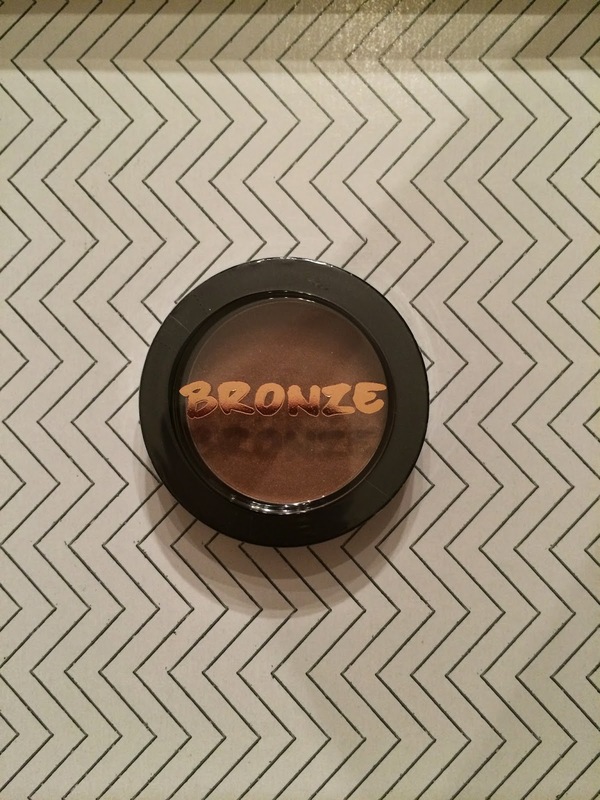 I love bronzer and I was hoping this wouldn't be too shimmery on my skin. Plus I like this brand, based on other products I've tried. It provided a subtle color to my cheeks with minimal shimmer, which was perfect for my fair skin. Another winner! The Supergoop! 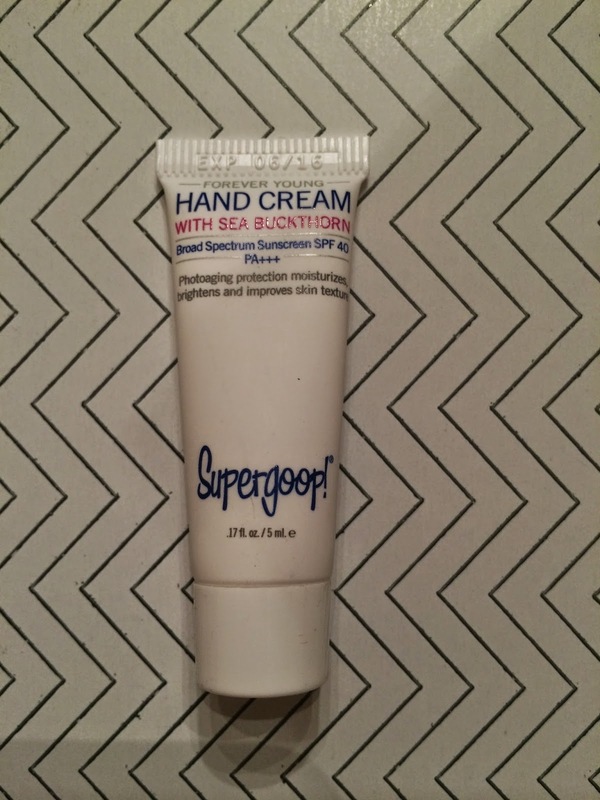 Forever Young Hand Cream with Broad Spectrum Sunscreen SPF 40 smells amazing! Berry scented (subtle and perfect, not too sweet and girly like it sounds)! It sinks right into skin and does not leave hands greasy or wet feeling. My only gripe with this sample is it is so small. I want more of this!!! 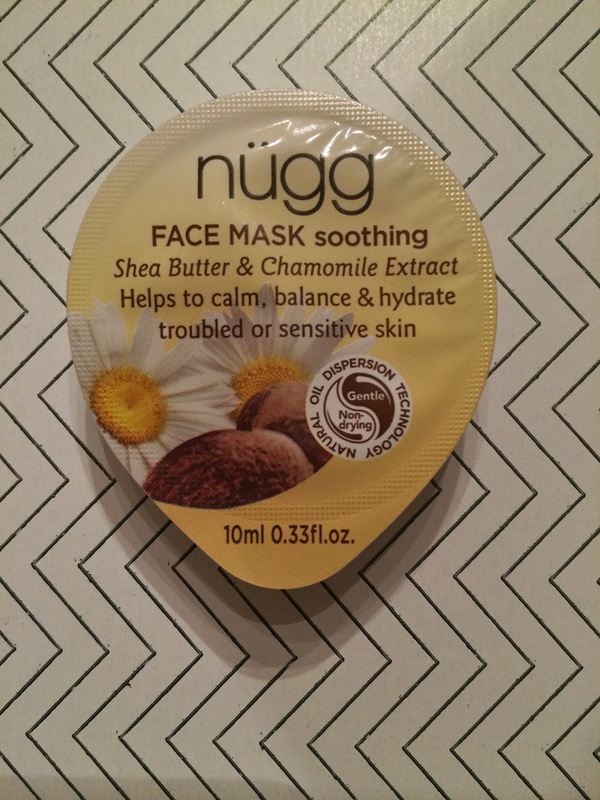 The final beauty extra product included was Nugg Beauty Soothing Mask. I love masks, so this was the first product I tried from my box. And since they are single use packs, I smeared the whole thing all over my face (which was probably double or triple what I needed). My first thought was it smelled nice, just like chamomile! The mask was supposed to relieve dryness, redness, and irritation within 5-10 minutes. And based on the ingredients I thought it would, but it had an opposite effect on me and made my face feel tight and dry. I couldn't get it off fast enough and it didn't come off easily (I may have used too much). Needless to say, I probably won't be trying it again. I liked all my samples this month, except one and that is a great box in my eyes! I love that Birchbox has been letting subscribers choose one sample each month (even if we break the site every time it goes live). I hope they continue! And I have one last Birchbox item to talk about. 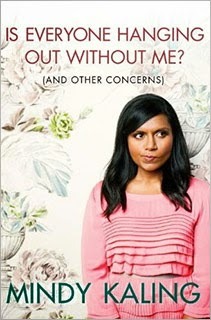 Birchbox gave bloggers the opportunity to review Mindy Kaling's book, "Is Everyone Hanging Out Without Me (And Other Concerns)" and I got a copy. I was so excited to read this book. And I was happy I didn't have to try to get it as a gift with purchase! To be honest when Birchbox does gift with purchase items I always miss out. I'm the person who orders a few minutes too late and it looks like the item is in my cart, but then it doesn't show up in my package and when I inquire they say they ran out. Bummer. Well this book came out as a gift with purchase, free with purchase of $35+ using code Mindy (not sure if it's still available). This is a really quick and fun read! It takes me forever to get into a book and actually finish it. (I'm not entirely through this one yet, but so far it's funny and enjoyable) I would say the average person could read it in a couple days, it is not very long and definitely keeps you entertained. It is basically the story of Mindy Kaling, and who wouldn't want to read a comic's book?!? I recommend getting your hands on the book!